The gigantic war continues unabated. 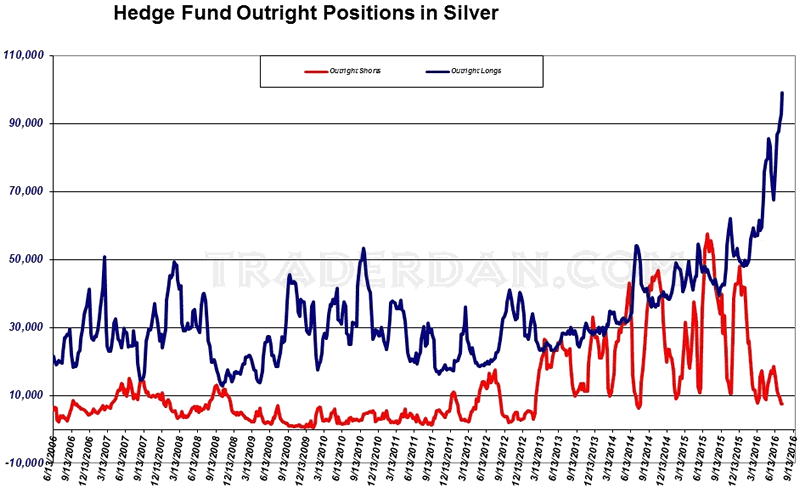 Hedge funds keeping pile in on the long side while Commercials and Swap Dealers keep selling them all they want. The hedge fund net long is at a new all time high. The Swap Dealer net short is also at a new all time high. 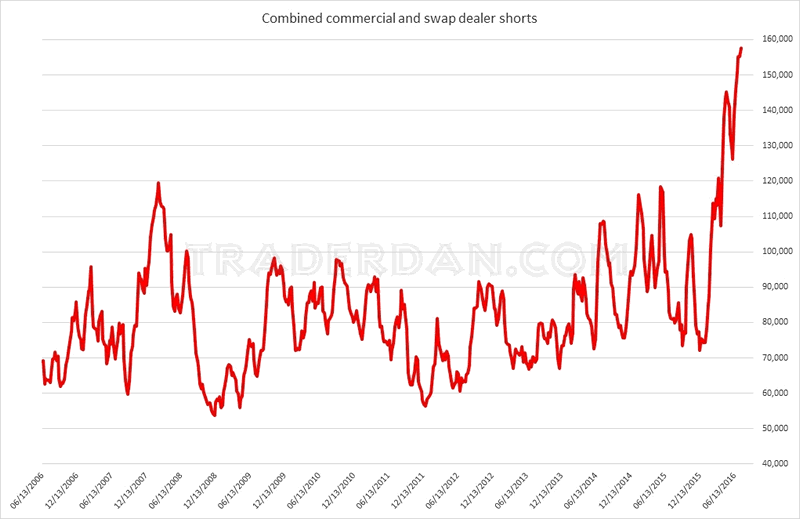 Commercial net shorts are fast approaching the all time high set back in October 2009. The difference between the imbalance between the hedge funds longs and the other large shorts is being supplied this time around by the Swap Dealers whose net short position is nearly 9x as large as it was back when the Commercials notched their all time high in short positioning. In trying to understand this, the following comparison chart helps to shed some light on the subject. 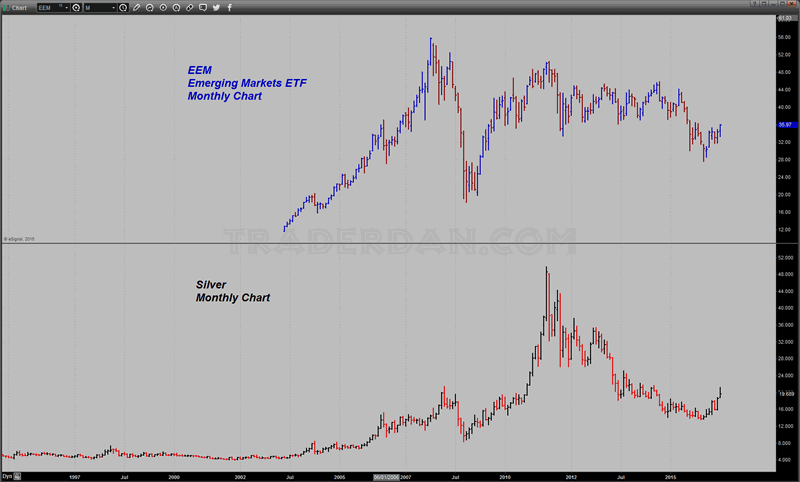 If you study this chart carefully, you cannot help notice how closely the silver price has tended to move along with the overall EMERGING MARKETS for a long time now. Try not to get hung up in the actual price levels of either asset but rather the general direction of price movement for both. It is rather remarkable is it not? Here is a more short term look at the same two assets. 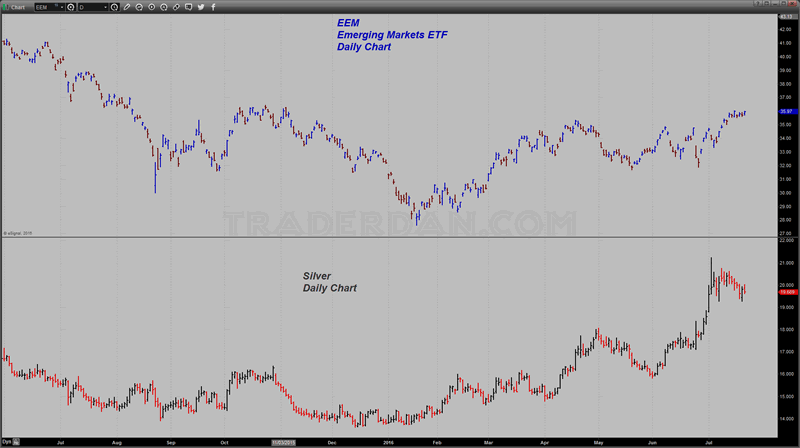 There has been a bit of divergence between the two recently with silver clearly outperforming the EM's late last month ( June) but lagging by comparison so far this month ( July). I look at the Emerging markets as another one of those excellent indicators of investor RISK APPETITE. That sector gets savaged when investors are scaling back RISK BETS. On the other hand, when investors are in the mood for risk, they pile into the Emerging Markets. In a note to clients this past week, JP Morgan states that retail investors stashed $10.2 BILLION into emerging market stocks and bonds, the second-largest amount on record, as recorded by a story on Dow Jones. While the International Monetary Fund just recently downgraded growth prospects for developed economies, they did not do the same for emerging markets. With the Fed and other Central Banks in no hurry to raise interest rates, there are few if any headwinds for emerging markets. The one thing to watch will be the US Dollar in this regard. In times past, a strong US Dollar has tended to coincide with downward pressure on Emerging markets. Keep in mind that while the Fed's mandate is not supposed to cover international developments as a result of their monetary policy stance, they have nonetheless not been shy about referring to overseas developments as impacting their thinking on interest rate policy. 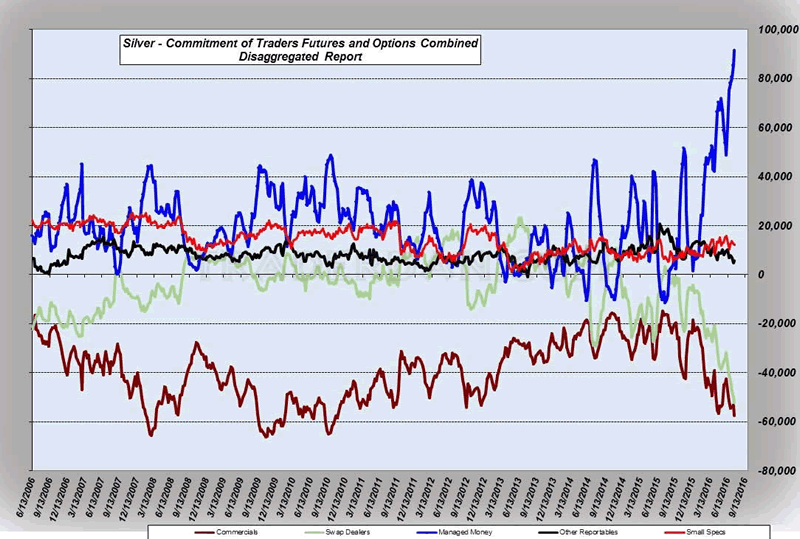 I have stated all of this to make the point that this titanic struggle is in reality nothing more than a huge standoff between hedge funds who are piling into silver as evidence of a general trend towards RISK TAKING and Commercials and Swap Dealers who do not see current silver demand sufficiently strongly enough to justify prices at these levels. With all of the hot money unleashed by ultra low interest rate policies here and abroad, the sums of capital that can flood into RISK ASSETS is simply enormous. That is why we keep seeing more and more hedge fund buying in spite of the fact that the commercial side is equally determined. The amount of speculative inflows seems inexhaustible when one considers just how yield starved so many investors are world-wide. Money managers get paid to produce returns on invested capital and right now there is a lot of that capital seeking yield. They really have little choice but to plow it into any asset class that they believe they can push higher. 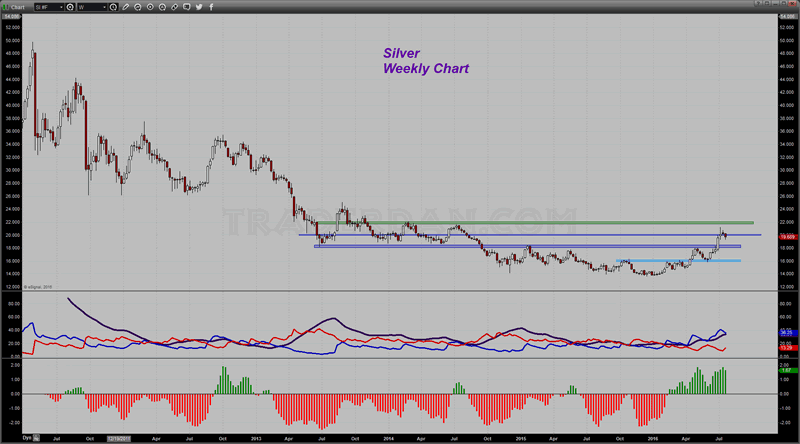 All of this being said, the composition of this silver market internally is becoming extremely unnerving for me. As long as the assumption that Central Banks are going to keep the liquidity spigots wide open indefinitely remains the general consensus, there does not seem to be anything that might upset this relentless chasing of risk assets. That is all fine and dandy - what bothers me however is I know full well how fickle this hot money can be. It can shift faster than Donald Trump or Hillary Clinton can change a position on an issue. Because of its very nature, it is impatient. 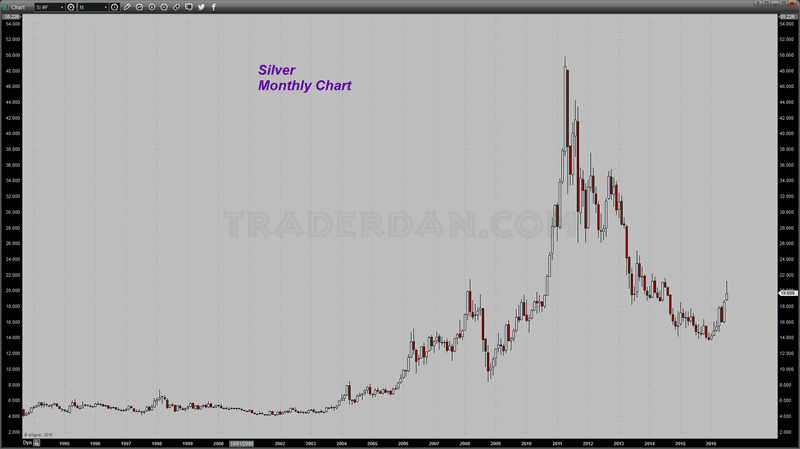 If upward momentum stalls all the while the market grows increasingly lopsided, as silver is currently doing, all it takes to send this money packing is the breaching of a downside chart support level. That is when anyone who is carelessly indifferent can get seriously hurt. If you are long in silver - be cautious and whatever you do, do not grow careless or listen to the siren song of the gold/silver cult gurus. We are in very unsettled times and quite frankly, into uncharted waters when it comes to how all of these Central Bank machinations in our interest rate markets are going to play out. Before you succumb to their predictions of $100 silver, let's first see if it can get back above $20 and particularly if it can clear $22.